A picture perfect history of town’s cinemas | The Dacorum Heritage Trust Ltd. 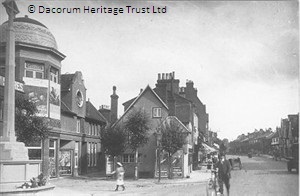 The first cinema in Berkhamsted was The Gem Picture Palace, which opened in the spring of 1911 in Cowper Road, between the Sayers Almhouses and the former Wesleyan Methodist Church (now the Church of Christian Science). It was a corrugated iron building with a noisy gas engine and an unreliable projector, according to Percy Birtchnell. If there was a long wait for the film to be restarted, the audience walked out and had their money back. It had a seating capacity for 168 people. Kitty Wilkins was the pianist. Prior to this, films had been shown at the Town Hall and by Taylor’s Royal Electric Coliseum de Luxe, a travelling show, which played for two seasons in 1910 and 1911 in the meadow behind the Crooked Billet. 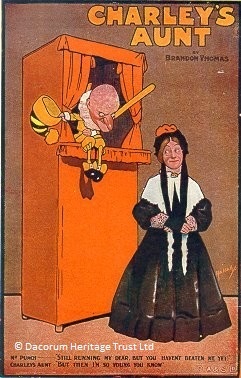 The Gem was unable to compete with the new Picture Playhouse,opened around November 1912. The building was then used as an auction room until it was purchased in 1916 by the gas company as a warehouse, but then requisitioned by the Inns of Court regiment for training and storage during the 1st World War. The building itself was demolished in the early 1960s. Two houses now occupy the site. The Picture Playhouse, Prince Edward Street, was founded in 1912. Some local businessmen commissioned a London architect, Herbert A.Bowes, to convert the stables of the King’s Arms Hotel into a cinema seating 340 on a raked floor with a screen 12ft by 9ft wide. The projection box was above the entrance, supported by four columns at the head of some steps. The space underneath formed an open lobby. There were a pianist and a violinist and there were occasional live acts. After a shaky start the Picture Playhouse closed and the seats were removed for use in the cinema, the Court Theatre. The building was later enlarged. It became known as theKing’s Halls and was in use until the 1980s. It has now been replaced by an office block, Fells House. The Court Theatre opened on 24 March 1917 in the High Street on the corner of Water Lane. It was named after the Inns of Court Officer Training Corps stationed in the town and provided entertainment for the troops. The regimental band played on the opening night. It was built on the site of the former Smith & Locke brewery and was designed by the architect, Ewen S. Barr. The owner of the disused brewery became a partner with the Picture Playhouse’s owners There was seating for over 700 including the balcony and some family boxes. The first manager was C.W. Fox who transferred from the Picture Playhouse. Due to the shortage of men during the war, an all-female group was formed to accompany the silent films. The Court originally had a green dome but this was later removed. By March 1930, the cinema had been acquired by the Shipman and King Circuit and in 1934 it was extended to seat nearly 1,000 people. Modern decorative grilles and concealed lighting were installed in the auditorium, together with a Christie organ. When Shipman & King later built a second cinema, the Court became less important. It had retained its stage facilities and the Berkhamsted Amateur and Operatic and Dramatic Society put on many shows there. The Berkhamsted Repertory Company was formed and held a successful season from April 1939 to January 1940. Films returned in February 1940 and continued, apart from temporary closures, until June 1960. The Court was then closed and replaced by a Tesco supermarket. 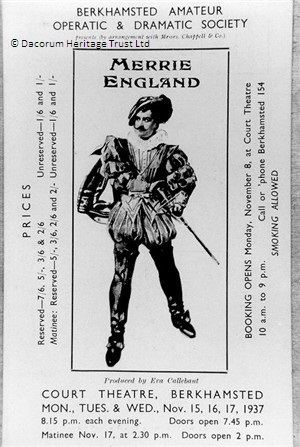 Cover of Programme cover for a performance of “Merrie England” by the Berkhamsted Amateur Operatic and Dramatic Society at the Court Theatre, Berkhamsted, 1937. The firm of S & K apparently specialised in having pairs of cinemas in the same country town. One was usually in a converted old building and the other a new, specially designed building. And so the Rex was born – but that is another story! The story of Dacorum’s many historic cinemas is well told in the book by Allen Eyles, Cinemas of Hertfordshire, published by The University of Hertfordshire Press in 2002.